Nordic Bet Poker Bonus Code: NORDICBET1000 to Get up to €1,000 for Free! Claiming bonuses at NordicBet is easy. Simply log into the poker software and click on “My Account” and “Available bonuses.” Here you will enter the bonus you want to use. You’ll then be ready to start clearing your bonus, earning some extra free money. Unlike most of its competitors, NordicBet Poker offers you a choice between four separate welcome bonuses. This gives you the chance to select the one that’s best for you depending upon the stakes you play and the amount of volume you think you’ll be able to put in before the 60 day expiry. Making this deal even sweeter is the fact that you don’t need to make a deposit of a certain size to qualify for even the largest bonus. As long as you keep playing at the tables, regardless of the size of your deposit, you’ll continue releasing portions of your bonus until you’ve completed all the wagering requirements or time runs out. Players must activate their bonus within 30 days but have 60 days to earn as much of it as they can. This bonus tops out at €50 and requires a total of €250 to be raked. It is paid out in 25 x €2 pieces. With the NORDICBET100 poker bonus code, you can earn up to €100 in bonus by achieving a rake total of €500. The bonus is released in 20 equal parts of €5 each. Get 10 bonus chunks of €25 each for a total of €250. To earn the full bonus, you’ll need to rake €1,250. For serious rounders, the NORDICBET1000 bonus offers a nice €1,000 in bonus funds. You must generate €5,000 in rake to unlock the full bonus amount, but you can clear only half of it if you want because it is issued in two pieces of €500 each. Flopturnriver recommends using this bonus code so long as you can rake at least €2,500 within two months since it is the largest bonus offered at Nordic Bet Poker. It’s easy to determine how much you need to play in order to fully maximize your use of your Nordic Bet Poker Bonus Code. Every one of the welcome bonuses on offer requires you to rake five times the amount of the bonus. Simple math will show that you’ll be achieving a cashback rate of 20% with these bonuses. For instance, if you decide to take advantage of the NORDICBET1000 bonus code to receive a €1,000 bonus, you’ll have to rake €5,000 in order to earn it all. Although NordicBet uses Poker Points to track how much you’ve played, using them to determine your bonus clearing progress is dicey at best. The bonuses are denominated in euro, the clearing requirements are in euro and rake is taken in euro. Nevertheless, the poker room calculates poker points based upon dollar equivalent paid in rake or tournament fees. Therefore, it’s better to ignore poker points and instead view the information contained in “My Account” —> “My Bonuses” to get an idea of how you stand with respect to your bonuses. The ease with which you clear your Nordic Bet Poker bonus code will depend upon which one you choose. Look at the chart on the right of this page to get an idea of how fast or slow the €1,000 bonus will clear based upon the specific games that you enjoy playing. Note that the stake levels in the chart are expressed in dollars, but the numbers contained therein really apply to the euro equivalents of those games. If you enjoy playing tournaments, then you can play 1,000 €50 + €5 events to clear the maximum €1,000 bonus. If cash games are more your speed, then you can play 66,667 hands of €100NL 6-max instead. In case you’re using one of the smaller bonus codes, simply divide these numbers by an appropriate factor to get figures that apply to your case. 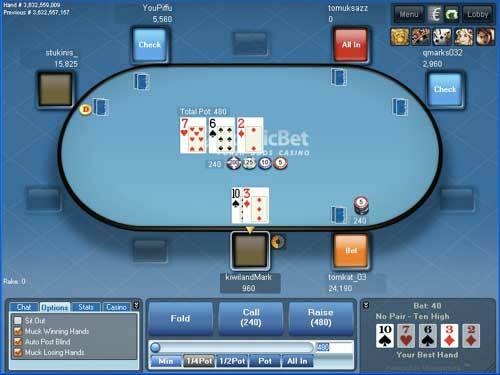 Overall, the Nordic Bet Poker Bonus represents a solid value. It’s not quite free money, but if you put in the work, earning the €1,000 is doable. You won’t find a better bonus on the Microgaming Network. Those poker points that seemed utterly useless when calculating bonus requirements actually do serve a fruitful purpose at NordicBet Poker. By collecting as many of them as you can, you’ll be able to progress through the Poker Rewards program. Start out at Bronze level and work your way up to Elite. Some of the benefits of this program include cashback, free sports bets, freerolls, reload bonuses and more. During the first week of each month, you’ll get an email from Nordic Bet informing you of your level and instructing you on how to claim your rewards for that month. At the highest level, Elite, you’ll receive 30% cashback, a free €25 sports bet every month, 50 monthly free casino spins, and more. According to NordicBet’s website, you can get “56% insane valueback” merely by raking €500 in a calendar month. Between the welcome bonus and the Poker Rewards program, there are plenty of free benefits being thrown around at Nordic Bet Poker. Be sure to claim your share of them by using our links below to register your new account!